A Fully 3D Printed Rocket Is Not as Crazy as it Seems. Investors Agree. Test flights may start in 2021. That’s how long it will take to produce and launch a rocket if the parts are 3D printed, according to the CEO of Relativity Space, a startup that seeks to do just that. Flying something made completely of 3D-printed parts into space sounds, frankly, pretty bonkers. But investors are on board. The Los Angeles-based startup recently secured $35 million to go ahead with its plan to produce a fleet of spacecraft using one of the largest 3D printers known to man, known as Stargate. Relativity is not the first company to bring 3D printing to space. SpaceX has done it for its reusable rockets, and even NASA is looking into which spacecraft parts can be made more reliably and cheaply by 3D printers. But Relativity stands alone in that it wants to print nearly all of a rocket — 95 percent of it — and by cutting the number of components that go into it, from from 100,000 to fewer than 1,000. Since its launch in 2015, the company has raised more than $45 million, promising to speed up the production of rockets. The company plans to use this most recent cash infusion to buy a second Stargate printer, and to grow its staff. A first round of tests on the company’s 3D-printed Aeon engines should be carried out before the end of the year. 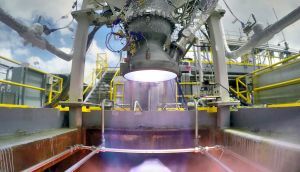 Relativity wants to put nine of those engines on its Terran rocket, which will have a 3D-printed booster, too. The company expects that each launch will cost about $10 million. Relativity aims to send about 1,250 kg (2,756 pounds) into orbit. That’s minuscule compared to SpaceX’s Falcon Heavy payload of 64,000 kg (64 metric tons, or 141,096 lbs), which is more than 50 times bigger, but quite a bit larger than the smallest rockets around, which can carry up to 150 kilograms. But that’s just fine for Relativity. The company wants to tap into different markets, mostly launching commercial telecommunication satellites into low orbit, and feels no compulsion to compete with the likes of SpaceX or NASA. And if you consider that NASA recently made it clear that it has no intention of buying SpaceX’s rockets, Relativity’s plan seems to be a safer bet. One day, Ars Technica reports, the startup hopes to send its rockets to Mars and back. But for now, it’s secured a solid foot on Earth, with a 20-year lease of NASA’s 25-acre E4 Test Complex at Stennis Space Center, in Mississippi. Relativity plans to launch a first test flight by the end of 2020, Ars Technica notes. Should that be successful, commercial launches will begin in 2021.